Best Rotary Tool Accessories 2019 - How to Pick The Right Accessories? Rotary tool attachments help us best use our rotary tool accessories. 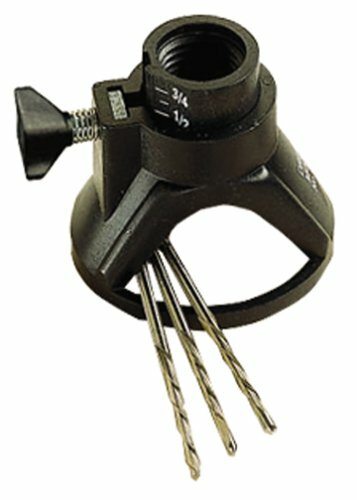 They include all these attachments that we incorporate into our rotary tools for flexibility, precision, and accuracy. They can be broken down into four categories. The right angle rotary tool attachment is designed to use accessories at a right angle. It helps you work on hard to reach areas like corners and inside the cabinets during remodeling tasks. It has been designed with a coupling system that allows you to rotate it in 12 different directions on your rotary tool. 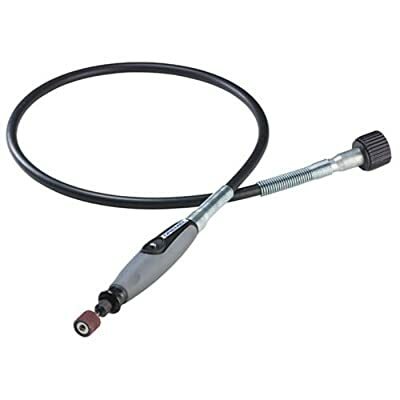 The Right-Angle attachment can be used when drilling holes, sanding, cutting, and grinding. All you need is to attach it to your rotary tool and then fix an accessory. Depending on your rotary tool, you may need a wrench during the exercise. 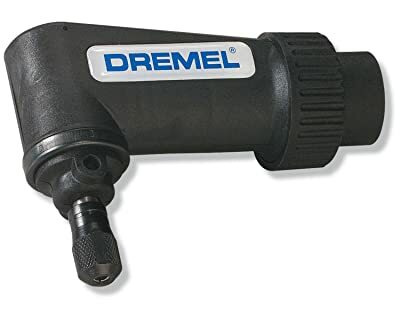 This attachment is best used with the drill bits and sanding drums. You may need to drill into hard to reach areas like inside permanent cabinets or sand them before repainting. With this attachment, all you need is the right bits or sanders and you are good to go. 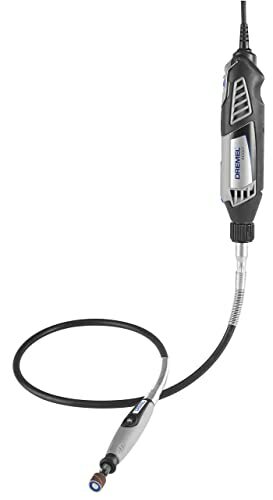 The flexibility shaft attachments are ideal for people who use rotary tools for detailed work that needs precision. Such tasks like wood carving, glass engraving, etching, and jewelry polishing need accuracy and precision. With the Flex-Shaft attachment, you will easily get such tasks done, thanks to the comfortable grip that offers a better control. Using the Flexibility Shaft attachment is pretty easy. All you need is to attach it to your rotary tool and then fix the right accessory. Depending on your rotary tool, you may need a wrench. Never bend the flex-shaft while it is in use. Inside the shaft, there is a rotating mechanism that helps in transmitting the rotary power from the rotary tool to the flex-shaft tool control. Nonetheless, you should securely place the rotary tool on a clamp or hook it on the wall while using the flex-shaft control. Ensure that the rotary tool is above the flex-shaft attachment for better performance. Sharpening your chainsaw or gardening tools has never been easy. This attachment comes as a kit with three grinding stones, adjustment gauge, and an angle guide. The attachment helps you sharpen your tool blades faster and easier. Always start by determining the grinding stone that you will be using. The three grinding stones will help you achieve different results when sharpening. Attach it to the rotary tool before fixing the angle guide and adjustment gauge. The sharpening process produces a lot of sparks. You will need to wear eye protection gear like goggles and gloves. Your regular sunglasses will still suffice the need. 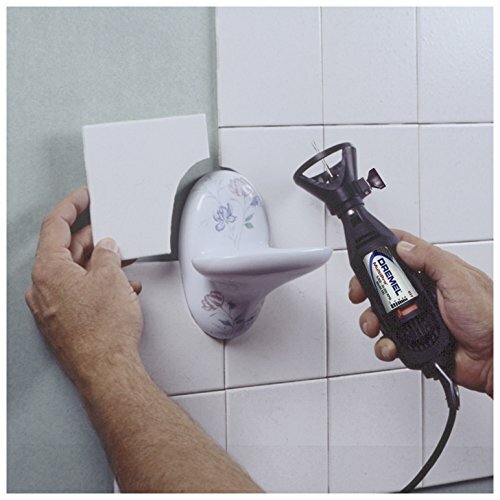 The wall-tile cutting kits feature an adjustable cutting guide and one tile cutting bit. It offers for controlled cutting on ceramic wall tiles. The cutting guide can be adjusted to 19 mm (0.75 inch) in depth (tile thickness). In case you desire to put some fixtures on your bathroom walls, you will most likely need to cut into the wall tiles. The wall tile cutting attachment is the right accessory for this job, since it offers for better cutting with precision and accuracy. Avoid using the bit on floor ceramic tiles. However, you can use the adjustable guide with a floor bit when cutting floor ceramic tiles. The kit easily attaches to your rotary tool. Depending on your tool, you may need a wrench in the process. Moreover, always remember to adjust the depth before working on your tiles to avoid cutting into other fixtures. 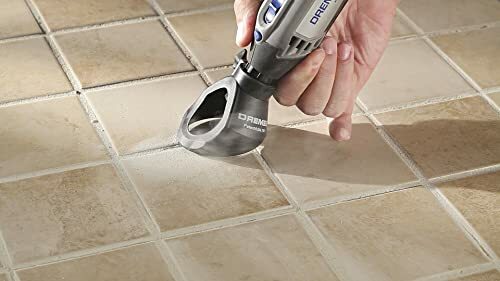 Find more tools to cut ceramic tiles here. 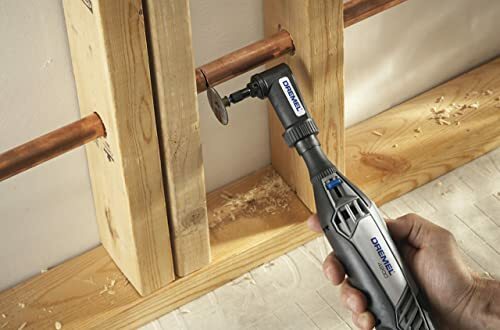 The multipurpose cutting kit attachment offers for controlled cutting in various materials like ceramic tiles, vinyl siding, wood, plywood, fiberglass, and drywall. The kit comes with a cutting guide and cutting bits. Moreover, it offers for easy depth adjustment that can go up to about 19 mm in material thickness. The cutting guide is similar to that of wall-tile cutting kit. All you need is to fix the cutting bit on your rotary tool and then attach the cutting guide to use the kit. You can easily adjust the cutting depth without the need for other tools. I would advise that you try the kit on scrap material like ceramic tiles and wood before using it on your walls or floor. This way, you will understand how deep you need to adjust the guide for accurate cutting. 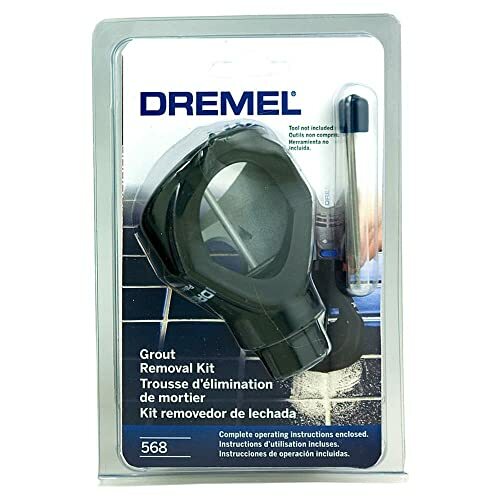 The Grout Removal kit attachment helps you remove grout between wall and floor tiles during a remodeling exercise. It reduces the risks of chipping your tiles that would have occurred in case you relied on manual chiseling. The kit comes with an adjustable guide that has a slanting base. 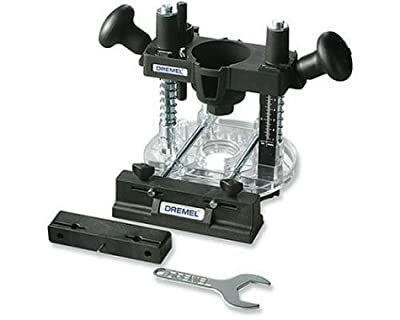 This base design helps you put your rotary tool into use while at the same time have a clear view of the surface that you are working on. Hence, making mistakes like cutting into your tiles is easily avoidable. You only need to fix the grout removal bit and then attach the guiding attachment in order to use the tool. The guide keeps the bit centered between the tiles while offering for easy adjustment. Working on tiles with the grout removal bit is an exercise that produces a lot of dust. Hence, you will need eye protection gear like sunglasses and gloves. The Mini Saw Kit features a mini-saw attachment, driver cap, and rip/crosscut blade. This attachment will transform your rotary tool into a precision circular saw cutter. 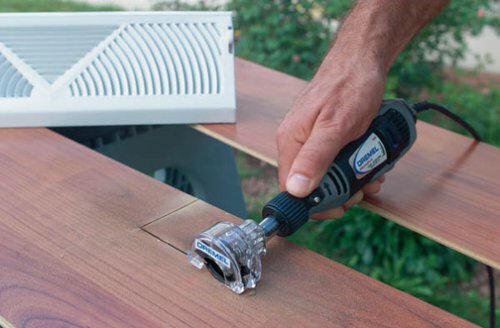 You can use it when making clear, straight, and fine cuts in all sorts of wood and laminate. The only drawback of this attachment is the fact that it can’t be used to make deep cuts. All you need is to attach the mini saw attachment on your rotary tool and then fix the Rip/Cross-Cut Blade and driver cap. It can be done with the help of a wrench for a tighter grip. To make deep straight cuts, consider using this mini-saw attachment to make a straight, precise cut. Then, you can use a larger cutting disc without the attachment to complete the final cut. 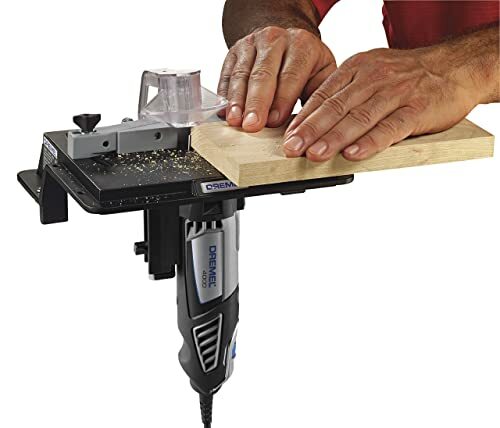 The Plunge Router attachment easily converts your rotary tool to a plunge router. Its clear base helps you see what is happening on the work surface. 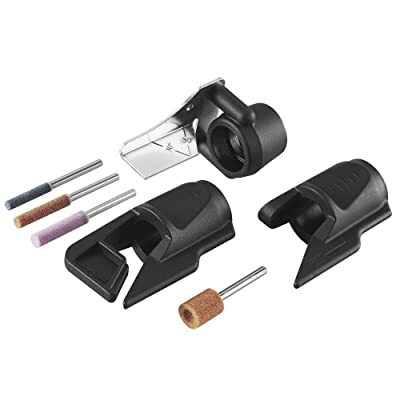 This attachment comes as a kit that includes a plunge router, circle guide, edge guide, wrench, and guide bushing set. 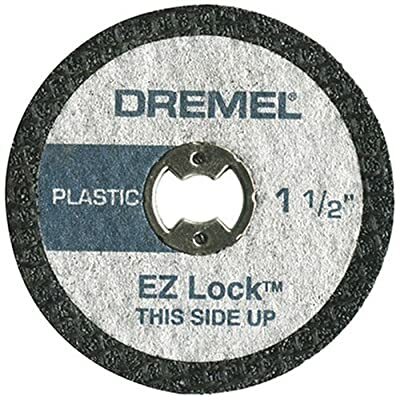 With it, you can rout inlay work, signs, decorative edges, and circles. Fix your rotary tool on the plunge router attachment and securely lock it in place. The attachment accepts most of the corded rotary tools. To unlock or lock it in place, simply turn the handle. 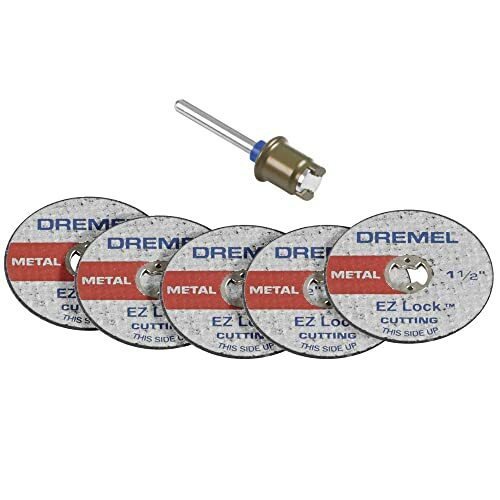 Depending on the type of routing that you need to accomplish, you may need the circle guide or edge guide. You will also need to adjust the routing depth as per your desire. What is the easiest way to convert your rotary tool into a bench mounted tool? With it, you can manage to precisely sand, groove, shape, and route items that are either irregularly or conventionally shaped. Always begin by inserting the accessories before fixing the router table attachment. You may need a wrench in the process. The 3-way adjustable fence helps you get accurate results. The rotary tool will move back and forth on the bench as you work on your desired surface. Rotary tool bits can be classified into two main categories. These are carving/engraving and cutting/drilling bits. Carving and engraving bits feature tungsten carbide high-speed cutters and diamond bits. They come in different shapes, sizes, and designs. 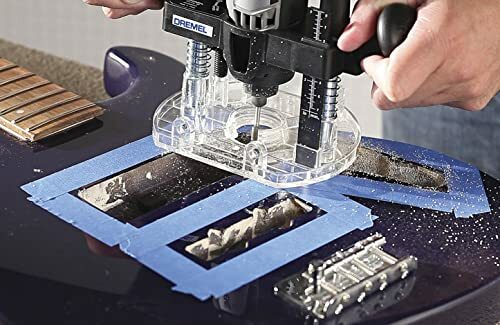 The diamond bits are used when engraving on glass, steel, ceramic tiles, and mirror, while high-speed cutters are mostly used when carving on wood, book board, clay, and plywood. Cutter bits are ideal when using your rotary tool for wood carving since they have coarse surfaces. When engraving on glass, you will start by working with the tiny-headed diamond bits to trace the outline. You can later use the larger bits to fill in the patterns and letters. Engraving high-speed cutters can also be used when creating the outline where tracing isn’t needed. Similarly, start by using the sharp high-speed cutters to create the carving outline on wood. Later, fill in with the big-headed bits. 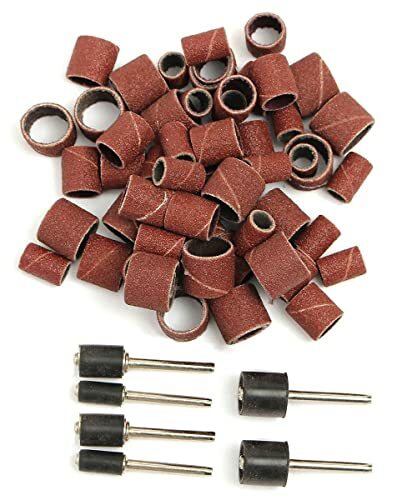 Tungsten carbide cutter bits and structured tooth tungsten carbide cutters can be used when smoothening wooden surfaces and edges during engraving exercises. 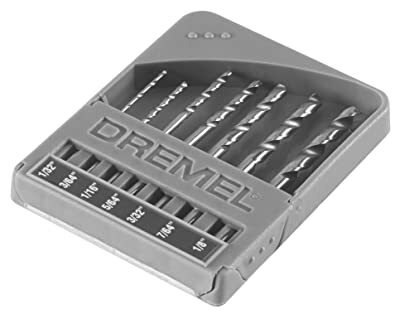 Cutting bits come with threads that mimic the traditional drill bits. 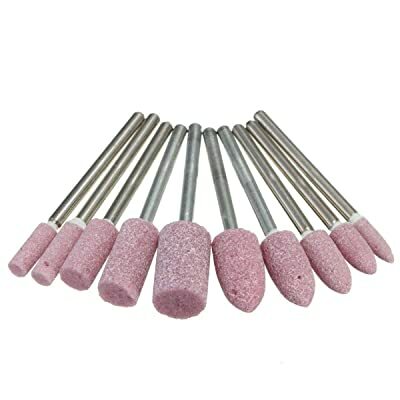 They are mainly used when cutting into ceramic tiles, drywall, and laminate. However, they can still be used on wood, fiberglass, aluminum, and plastic. The cutting bits can also be used to drill holes on these materials. 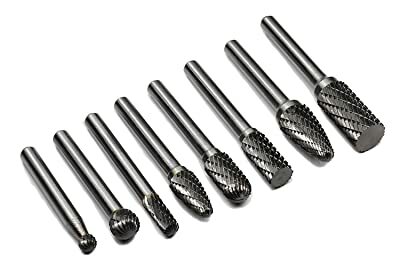 However, there are special drill bits that have been designed to best serve the purpose. These bits are made of high-speed stainless steel. Hence, they can’t be used to cut or drill into hard metallic surfaces. All you need is your rotary tool and the right bit. Use a wrench to fix the bit in place and you are ready to put it into use! Rotary tool accessories are all the assorted accessories that help you put your rotary tool to use. They include the sanders, polishers, cutting discs, and grinding stones. I would say they are anything else that isn’t a bit nor an attachment. Sanding accessories feature two parts. These are the sanding bands and sanding drums. The drums hold the sanding bands in place. Sanding bands come in various grits just like the traditional sandpaper sheets. Sanders can be used on wood, book board, aluminum, polymer clay, pets’ toes nails, and plexiglass. To use the sanding accessory, simply slide a sanding band of your desired grit on the sanding drum. Then, attach it to the rotary tool and slowly work on the surface. Sanding bands and drums come in various sizes. The smaller are ideal for precision sanding like wooden door knobs, while the larger are ideal for niche sanding or larger surfaces like cabinet doors. Always remember to replace the sanding bands when they wear out. It is pretty easy, pulling it out of the drum and fixing a new band. Grinding or sharpening stones look like the sanding accessories on the first glance. However, unlike the sanders, grinding stones come as a whole accessory. 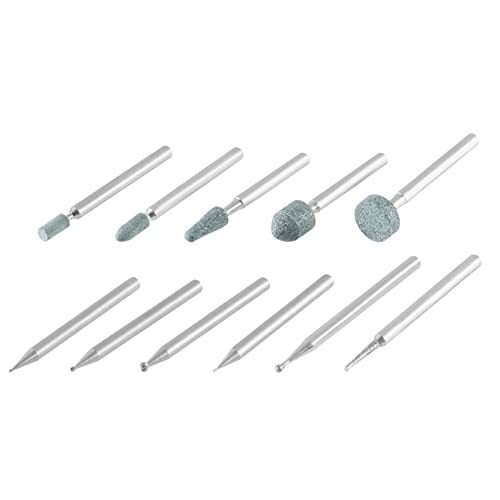 The accessory features a grinding stone that has been permanently attached to an arbor that you will use when fixing the rotary tool. 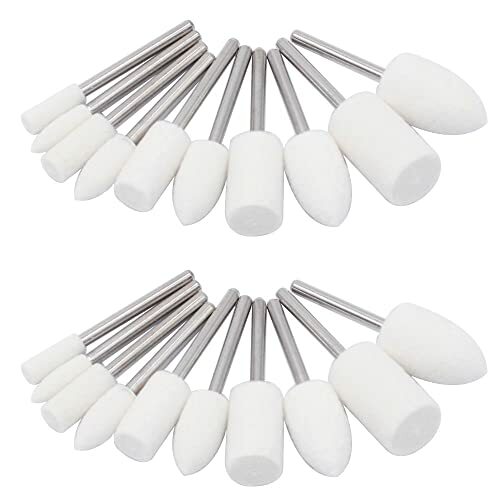 Grinding stones are either made of silicon carbide or aluminum oxide and come in different sizes and shapes. 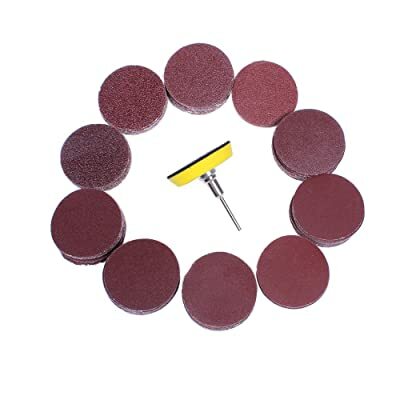 The aluminum oxide grinding stones come in brown, grey, pink, or orange colors. These stones can either be used on steel, ceramic, mirror, or glass. 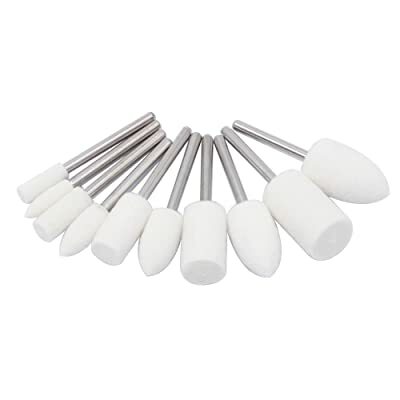 Thus, if you need to sharpen knives consider using the aluminum oxide grinding stones. On the other hand, silicon carbide stones are green in color. These stones aren’t as strong as aluminum oxide grinding stones. Hence, they are mainly used when sharpening mirror, glass, and aluminum. You will need to rotate them in medium speeds for better results. When they wear out after a consistent period of use, consider reshaping them with a dressing stone for better performance. Just like the name suggests, cutting discs feature wheel-shaped accessories that are used when cutting into different materials when rotated at very high speeds. These discs are made of different materials and intended to be used on different surfaces. Cutting discs also come in different sizes in diameters with the cut-off wheels being the smallest while the carbide wheels the largest. 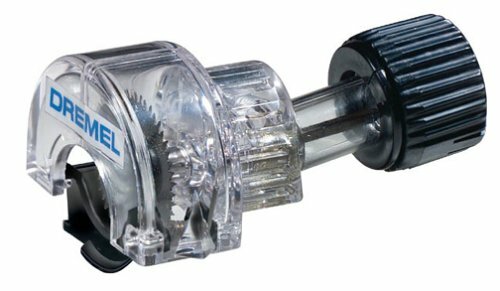 To use a cutting wheel, you will need to attach it to a mandrel. The process is pretty easy, whereby you only need to screw it on the mandrel and then attach it to your rotary tool. The most common are abrasive carbide cutting wheels. They can be used when cutting wood, plexiglass, and book board. They are either brown or grey in color. Avoid using abrasive wheels on hard surfaces like metals. Fiberglass cutting wheels are much stronger and can be used on ceramic tiles, aluminum, and wood. Different manufacturers have improvised stronger multipurpose cutting wheels that can be used on a wide array of materials including metals. Cut-off wheels are the smallest, yet strongest. They can be used on metallic surfaces like steel sheets, nails, and iron-sheets. Closing the list are cleaning and polishing accessories. They feature a mandrel/arbor and polishing felts. These felt come in different sizes and shapes, not mentioning that they are made of different materials. Some feature brass or stainless-steel brushes that have been permanently fixed on the arbor. These varieties are ideal for cleaning metallic surfaces. Attach the polishing felt on a mandrel. You will need to screw the mandrel into the polishing felt/wheel for a tighter grip. Depending on the type of the polishing/cleaning felts, they can be used on mirrors, silver, jewelry, glass, ceramic tiles, and aluminum. Different manufacturers have designed their rotary tool accessories in different ways. However, most of them can be used on a large number of the rotary tools in the market today. They might differ in shape or color, but will still fit on your tool and serve the intended purpose. I don’t think you can use a heim joint or rose joint with a rotary tool. To my knowledge, these joints are used in cars and other vehicles, not for a power tool.